. Del café maduro de las agrestes faldas de nuestras montañas y el amor al terruño y sus tradiciones.
. La esperanza de un mejor mañana y la bendición de la exuberante flora regional.
. Los dorados arrozales, orgullo de nuestra tierra y el calor canicular que templa al fruto y atempera el alma.
. El sentimiento de paz y la honradez sin mácula de las gentes. En la franja central y en sentido horizontal colocadas equidistantemente, las cuatro estrellas plateadas simbólicas de los cuatro principales núcleos de población rural (Cedral, García, Las Sierras y San Andrés). " The flag has four silver stars in the central strip. Also note that the image at this site show vertical stripes. I understand enough from the quoted text to know that this flag is supposed to be 1:2  the given specs are "two units and a half long by one unit and a quarter wide, divided in three equal horizontal stripes, whose length [here should be width, for consistence, amt] will be one third of a unit; the white middle bands separating the larger stripes will have a length [here should be also width, for consistence, amt] of an eighth of a unit". Reducing these fractions to least integers, the specs are (8+3+8+3+8):60 = 1:2. The official website mentions also that "horizontally on the central stripe" there will be "four silvery stars places at equal spaces". Lacking better specs and inspired by the image on the site I used white stars centered at halves and three-quarters of the flag area (respectively 15 and 25 off the vertical edges) for the above image. 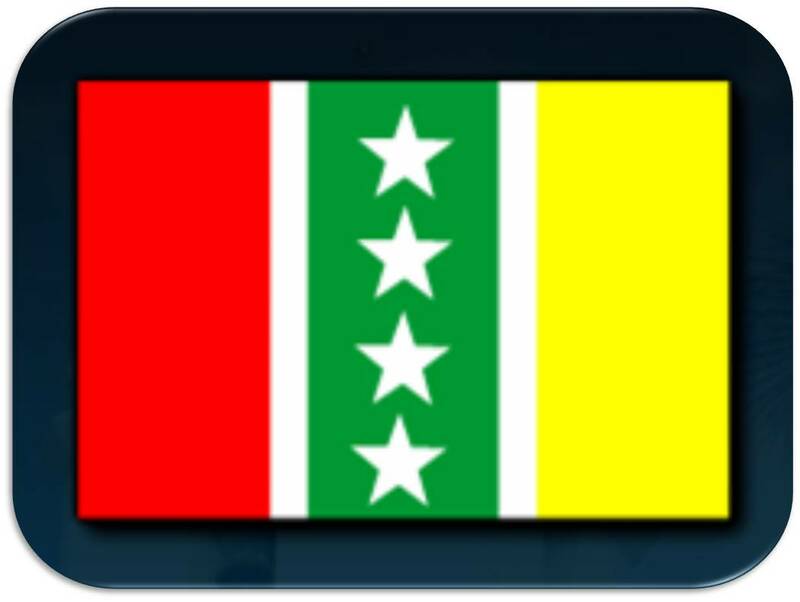 Our page also states that the official website shows an image of a flag with vertical stripes, although the law text clearly asks for horizontal stripes. The image, sketchy as it is, has been replaced online new image with vertical stripes at <tello-huila.gov.co>. I think that this kind of mistake, in an official source, a second time around must be more than just an oversight - maybe the flags used locally are indeed with vertical stripes (and in 2:3) and the language of the law is ignored or misinterperted?.